Royal Seals . . . . .
Royal Seals, Inc is a specialty supplier of Custom Molded Rubber & Plastic components. Our components are manufacturered to meet our customers’ strictest standards. Parts are available in all compounds, all shapes, and all sizes. Custom molded products include such items as Seals, Diaphragms, Boots, Bellows, Check Valves, Pads, X-Rings, U-Cups, T-Seals, Lathe Cut/ Square Rings, Rubber-to-Metal & Rubber-to-Plastic bonded. Materials include: Silicone (VMQ); Fluorosilicone (FVMQ); Fluorocarbon (FKM); Perfluoroelastomer (FFKM); Ethylene Propylene (EPDM); Neoprene (CR); Nitrile (NBR); Polyurethane (EU). Common agency related certifications ASTM, UL, FDA, JIS, ANSI/NSF, WRAS, KTW, and RoHS Compliance. 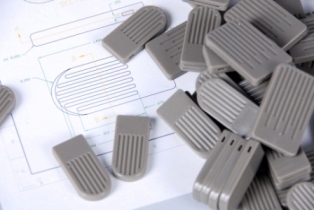 We are able to manufacture any product to customer drawings, specifications or samples. ^ Top | Home | Website Disclaimer | Copyright ©2006-2019 Royal Seals, Inc., All Rights Reserved.